I think your point on Barth and Scripture is a really important reminder. I just finished his Theology of the Reformed Confessions, and in the first two chapters of that book all he does is hammers the importance of Scripture to Him and His project (true this is early Barth, 1925, but I don’t think he ever avers from this conviction — what it means to be ‘Reformed’). This is one area, so I’m glad you mentioned this in re. 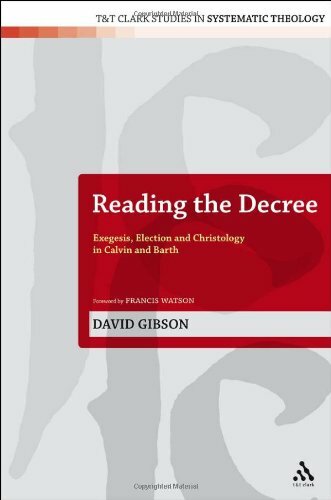 to Gibson’s book, that Muller in his ‘After Calvin’ dreadfully misreads Barth; painting the picture of Barth as a ‘centraldogmatist’ himself, not being a man of Scripture (thus not Reformed) — but a man of rampant Christocentrism that is purely dogmatically driven. I did start reading the first few pages of Gibson, last night; and you’re right, he almost immediately begins to use Muller, in ways that don’t seem that critical. But, as you commend, the book and content look very engaging; and I’m excited to continue reading it through. Moving very slowly thru it myself. It would be interesting to hear what Muller thought of his own use? Certainly Barth is Christocentric and dogmatic, but not negatively so. Thanks Jason. Looks like it could be worth a read….. (…dum de deee….. “click” …. checks out the price…. what? ….marked down from $130.00 to a mere $117.00) … can nearly buy all of Barth’s CD, in paperback, for that! Cheers!